The FOA is compiling a database of CFOTs who do installation, contracting or consulting. Our goal is to have it as a searchable database for everyone needing a contractor, many of which call us at the FOA for advice. The database lists CFOTs according to their areas of expertise and locations where they will do installs, plus a short description of their organization, work experience, etc. The database can be searched by any parameter so the user can get a close match to their needs for fiber optic expertise. If you are a CFOT who wants to be listed, go to the FOA Installer Database and register now. As soon as the database is ready, we'll announce it to the world of end users. As a result of the development of the FOA Installer Database (http://www.thefoa.org/index_installers.html), we received an inquiry from a contractor looking for 40 fiber optic and telephone installers to reconstruct the communications systems in New Orleans and other areas devastated this year by hurricanes Katrina and Rita. Fiber optic techs interested in this work should have relevant experience and their own tools. Companies with a full complement of OSP installation gear are welcome (and encouraged!) to apply. Housing is a problem and may require living in trailers or campers. Please do not contact The FOA - contact the company directly! And remember -please do not contact The FOA - contact the company directly! Another use for duct tape! A reader suggests applying the sticky side of duct tape to the area where you stick the fiber into your skin and the adhesive will pick the fiber shards out. Sounds worth a try to us, but we'd like more feedback. Be careful, but if you do have an accident, try this and let us know. Which Had You Rather Terminate? Now, isn't that a compelling reason to choose fiber optics! In keeping with the mission of the FOA as an international non-profit educational organization dedicated to promoting professionalism in the field of fiber optics, FOA board member Tom Collins traveled to Jamaica in October. Jamaica is interested in how fiber optics can improve their telecommunication systems. Both instructors demonstrated a high level of skill and knowledge about fiber optics and instructional methods. The FOA looks forward to strengthening their relationship with Vector Technology Institute of Jamaica and helping them train and certify more local fiber optic technicians. In addition to conducting the TTT session, Tom presented at the Jamaican Computer Society (JCS) conference on incorporating fiber optics into existing IT systems. After the presentation he opened the floor to the conference participants who asked many interesting questions about how fiber optics can enhance their present IT systems. At a recent show, we saw the new Chemtronics "QbE" fiber optic cleaning system. It's a continuous wet or dry wipe in a square box that has a soft surface on one side to wipe the connector against. 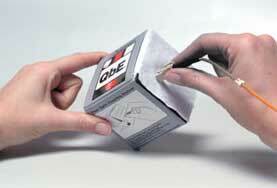 Several types of wet cleaners are available or you can use QbE dry. Besides using it for cleaning connector ferrules, the wipes can be used to wipe fibers before cleaving or for buffer tube gel removal. See more at the Chemtronics website. LumaCon has taken a simple idea and created what seems to be an ideal high density fiber optic interconnect. Combining machined metal connectors with 1.25 mm (LC, MU compatible) ferrules makes for a rugged high density connector for backplanes and multifiber connections without the use of more restrictive ribbon technology. More information is at the LumaCon website. Peter Buitenhek lives in San Diego and has been in cabling for 20+ years. He has developed five software packages for horizontal cabling design, bid and tracking that are inexpensive, quick and accurate. 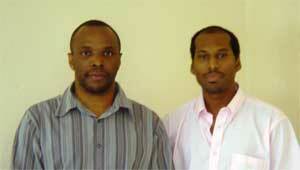 His packages are based on Microspft Excel spreadsheets which makes them cost effective and easy to use. His web site is at profitdeveloper.com. 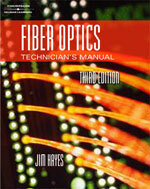 Order The Fiber Optics Technician's Manual directly from Amazon.com. Third edition of The Fiber Optic Technicians Manual Now Available! FOTM Lab Manual is available from Delmar (ISBN:1418028754, Price: $19.95) with tons of hands on exercises. For information on the Lab Manual or Instructors Guide, contact Delmar directly at 1-800-347-7707 for further information. Remember the CFOT Test now uses the new edition, along with the new NECA/FOA-301 Installation Standard. Another good book: Eric Pearson's Successful Fiber Optic Installation - a cookbook for fiber optics! A. Approx. 1905 KMs of Lucent Manufacture, Accuribbon Type, True Wave (TW), 216 Strands fibre. This cable was received into stock between October 1999 and January 2000. B. Approx. 942 KMs of Corning Manufacture, 2 Core Non-Metallic, NZ-DSF, 216 strands Fibre. This cable was received into stock between June and July 2000. C: approx. 1905 KMs of Lucent Manufacture, Accuribbon Type, True Wave (TW), 216 strands fibre. 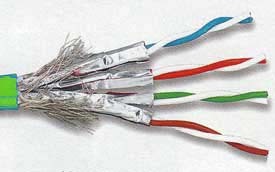 This cable was received into stock between October 1999 and January 2000. D. approx. 942 KMs of Corning Manufacture, 2 Core Non-Metallic, NZ-DSF, 216 strands fibre. This cable was received into stock between June and July 2000. The cable was manufactured for a German city-to-city and inner city network. The cable is the same stock that forms the fibre optic rings of many major European cities. There are no export restrictions on the cable whatsoever. All Cable stored in Secure Warehousing on 6000 mtrs reels. experience in design and construction of telecommunications outside plant networks. construction and creating "as builts" to accurately document the network. service level agreements. We offer high growth potential with an aggressive organization. sharing and or stock options based on performance. Assist in the development, improvement and implementation of manufacturing procedures and facilities. Develop written S.O.P.s used in the manufacture and testing of specialty optical fibers, including metalized fibers. Design and implement improvements to all production processes and assume responsibility for the technical guidance on all production operations. Formulate and implement Statistical Process Control (SPC) capabilities. Maintain and repair equipment. Establish and maintain preventative maintenance and calibration schedules. Provide liaison and support as necessary, to Production in the research and development of new fibers and fiber products. Prepare for full scale production capabilities, based on new/revised production specs. Operate fiber drawing towers, assist in testing as necessary. A new PowerPoint presentation in Spanish for instructors and anyone else interested has been posted on the FOA website for free downloading. It is an explanation of fiber optics in Spanish, created by Francisco Castro Cabrera of Mexico City, who is starting up our new FOA chapter in Mexico. It is complementary to our PowerPoint introduction to fiber optics in English. Here is more information on the presentation in Spanish. Every CFOT will now receive a free copy of NECA 301-2004, Installing And Testing Fiber Optic Cables, produced by The FOA in cooperation with NECA (The National Electrical Contractors Association). 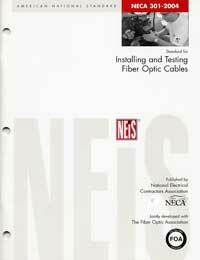 This is an important reference document for defining the installation and testing of fiber optic cable plants in a "neat and workmanlike manner." 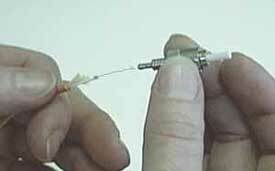 Fiber is touted for it's resistance to electromagnetic interference - electrical noise. Why does fiber not get affected by electronic or electrical noise? (C)1999-2005, The Fiber Optic Association, Inc.
Tech Puzzler: Fiber is made of glass or plastic, which cannot carry current and is not affected by electrical signals.